Embryo testing: Does personal experience make you morally wise? 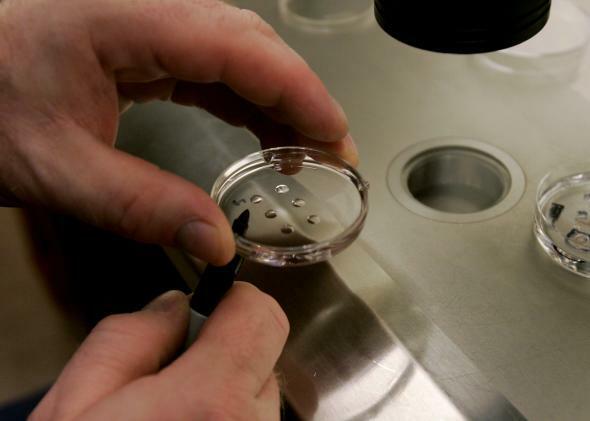 Human embryos in a dish at an IVF clinic, Feb. 28, 2007. It’s often said, wisely, that you don’t really understand the morality of a dilemma until you experience it personally. Abortion, homosexuality, war, immigration—everything looks different when you know the people involved and feel the emotions directly. That’s true of genetic testing, too. Two days ago in the New York Times, Gina Kolata told the story of Amanda Kalinsky, a 30-year-old woman who learned at age 26 that she would eventually die a slow, awful, premature death from a genetic disease. At first she assumed she couldn’t in good conscience bear children, since they might inherit the gene. But then she learned that she could create IVF embryos with her husband, test them for the gene, and implant the ones that would be disease-free. Embryo screening is a double-edged technology, full of grim possibilities. One worrisome trend is the spread of this practice from diseases that strike children to diseases that strike adults. It’s logical to question how far we should go in weeding out lesser or less immediate defects. But it’s pretty hard to sustain that abstract objection in the face of a story like this one, particularly when you see the doomed woman with her small children, none of whom would exist without the technology. That line chilled me. It exposed another side of the moral effect of experience. Getting close to a case like this one, even as a reader, can open your eyes. But being in the middle of a dozen cases, and then a hundred, and then a thousand, can do something else. It can pull you so far into the routine that you lose perspective. You can no longer imagine a case in which you wouldn’t screen the embryo. Experience teaches. And then, after a while, experience numbs. Beware.